ExoQuick is now ready for purifying exosomes for clinical use with a version of ExoQuick manufactured in compliance with 21 CFR 820. Based on SBI’s well-regarded ExoQuick-TC, SBI’s ExoQuick-CG exosome precipitation reagent makes miRNA and protein biomarker discoveries simple, reliable, and quantitative. Enrich for exosomal miRNAs with ExoQuick-CG and accurately profile them using SBI’s SeraMir qPCR arrays. Downstream protein analysis is also possible with SBI’s exosome specific antibodies and ELISA kits. Like ExoQuick-TC, ExoQuick-CG enables high-throughput, quantitative isolation of exosomes from most biofluids. Compatible with a wide variety of downstream applications, ExoQuick-CG is an effective and proven alternative to ultracentrifugation1-3. Just as with ExoQuick-TC, ExoQuick-CG can be used to purify exosomes from saliva1, urine2, follicular fluid3, tissue culture media4, and breast milk5. With a simple workflow involving minimal hands-on time and low input sample volume requirements, ExoQuick-CG is an excellent option for researchers who need to purify exosomes for pre-clinical, in vivo studies. With ExoQuick-CG, you can quickly and easily isolate high yields of exosomes using cGMP-grade reagents for any downstream application. 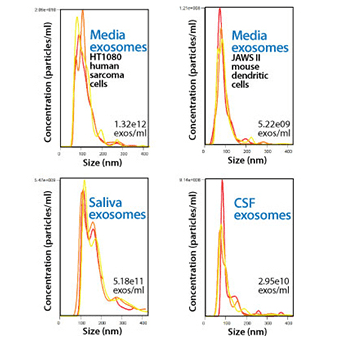 NanoSight analysis shows ExoQuick-CG isolates high concentrations of exosomes from a variety of biofluids, and that the isolated exosomes are in the expected size range (Figure 1). Figure 1. 3.3 mL of ExoQuick-CG was combined with 10 mL of conditioned media from either Human HT1080 lung sarcoma cells or Mouse JAWS II dendritic cells that had been cultured in Exo-FBS (exosome depleted FBS medium supplement, catalog # EXO-FBS-50A-1). All samples were incubated overnight at 4°C for exosome precipitation. Exosomes were resuspended in 0.5 mL of PBS and visualized on a NanoSight LM10 instrument. Western blotting of the ExoQuick-CG-isolated particles using an exosome-specific antibody (anti-CD63) further validates that the particles isolated with ExoQuick-CG are exosomes (Figure 2). Figure 2. Approximately 10-50 µg of exosomes from the NanoSight studies shown in Figure 1 were separated via denaturing SDS PAGE for Western blot analysis. CD63 protein was detected using SBI’s rabbit anti-CD63 primary antibody and SBI’s HRP-conjugated secondary goat anti-rabbit antibody (catalog # EXOAB-CD63A-1).